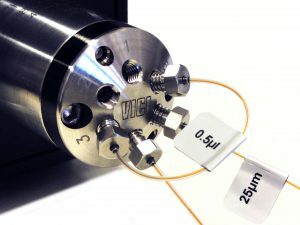 In our long history of Micro- and Nano-HPLC product developments, we had the chance to collect experience using many approaches on how to fit a thin glass tube into a large (1/16″) stainless steel port, which is what many HPLC and UHPLC systems employ to this day. The simple approach is to line the glass capillary with a softer material such as PEEK and use the clamping force of a conical ferrule to hold the capillary inside the sleeve. This approach is not suited for UHPLC pressures, at which the capillary will readily escape the sleeve. A newer technique is to use a tight metal jacket to press onto the plastic sleeve instead of a conical fitting, and use the front side of the assembly as a seal, instead of a conical ferrule. This approach is easy to use and can handle high pressures, but there is a grave downside: they only come pre-assembled, to be ordered from their respective vendors to a specific and standardized length. HPLC users who develop their own methods needs to make new connections as required, or create injection loops with a new specific volume quickly. Thus, a quick and easy way of assembling their own capillaries is a must. Key to the new product is a very simple improvement on the old principle with the PEEK sleeve: If we cannot rely on the conical ferrule to squeeze the plastic strong enough, we just add an extra, and wider, grip on the sleeve to squeeze it onto the glass capillary. And behold: it stays tight with 20,000 PSI. Say hi to the → ZircoFit™!